It's a known fact that, along with fruit, vegetables should be a major component of your diet. Though the truth is despite your best efforts you most likely don't come close to eating the recommended 5-7 servings per day. Not only are vegetables an important part of a healthy diet but they are also low in calories which makes them a great choice for those looking to lose weight. Be creative when implementing vegetables into your daily routine. One thing I like to do is sneak them in with my breakfast omelet. There are so many variations to the recipe below, making it a fun and easy way to eat more veggies. Heat 1Tbsp. of extra-virgin olive oil in a medium size pan, add the chopped mushrooms and asparagus. Cook until tender about 1-2 minutes. Remove the mushroom and asparagus mixture from the pan, placing it to the side for later use. In the same pan, add 1 Tbsp butter. In a small bowl, whisk together 2 eggs. Pour egg mixture into the pan and cook over medium heat until it begins to set, making sure that the sides stay loose around the edges and aren’t sticking. Add the asparagus and mushroom mixture to one half of the setting eggs. Add the diced fresh tomato, ham and feta cheese on top of the veggies. Cook until the top of the eggs begin to bubble and aren’t visibly runny but still soft and somewhat translucent. Fold the half without the vegetable mixture over the half with the vegetable mixture. Cook for 20-30 seconds more, or until the eggs have set further. Looks gorgeous, I could eat this for diner! I love veggie omelets and this one looks incredible! I wish this was my dinner tonight! We're big fans of omelettes around here! Yours looks great! You just can't go wrong with a good omelette!! That looks wonderful. I love omelets. Great dish and list of ingredients. I still can't figure out the right way to flip an omelet, ha! Love this though. 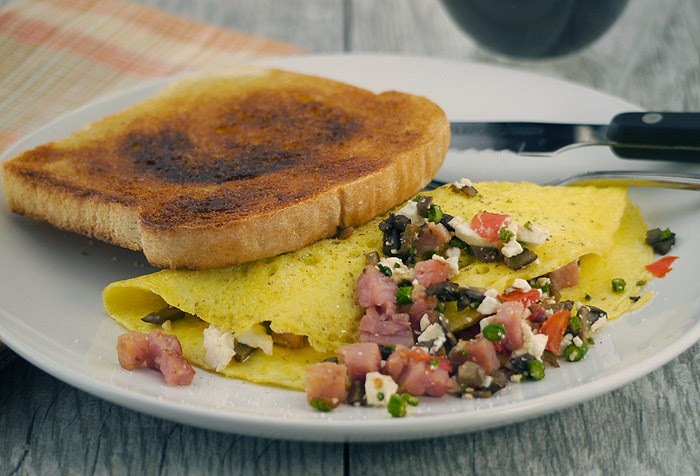 Looove omelets - breakfast, lunch or dinner! Looks delish! I could eat omelets daily and never get bored! Love this loaded veggie version! I love veggies in my omelet! This looks delicious!